Margaret visits Wisconsin annually because that's where her relatives are. She much prefers the northern California weather where she enjoys hand weaving, jewelry-making, and creating collages, some of which are inspired by Wisconsin. When my friend Dianne (editor of Clevermag) heard I was going to Wisconsin she asked me to visit some sights around Wisconsin and report back. 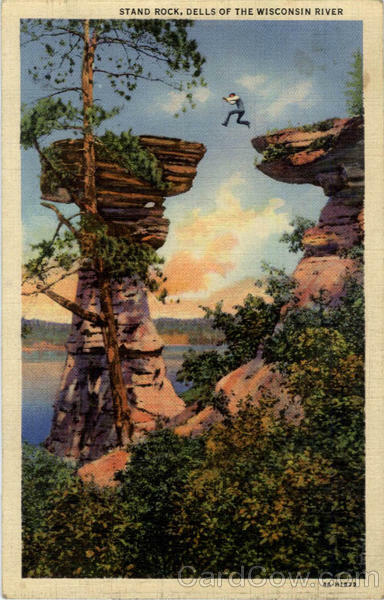 My extended family lives in Wisconsin so I visit them often, and occasionally I send Dianne a postcard of some of the odder points of interest I come across. I agreed. I began in Milwaukee because I planned to attend a convention there and then visit my family for a couple of weeks. What follows are some patched together emails of a few days I spent driving around Southwest Wisconsin as a special favor to Dianne (she owes me one!). 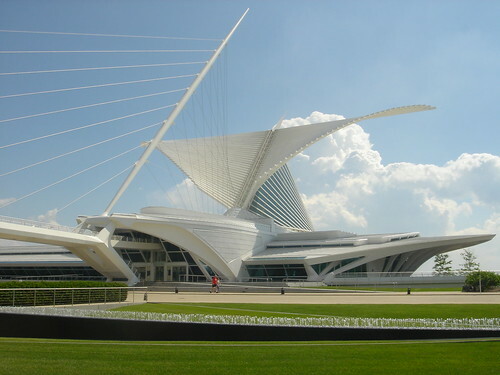 In Milwaukee I took the $1 loop shuttle for a tour of the city and got off at the Milwaukee Art Museum, the one with wings that open and close twice a day. There I saw an exhibit of French posters from the turn of the 20th century. Kind of amazing that they survived in such good condition. Interesting audio commentary too. They were setting up for a wedding reception in the museum lobby. A little odd for tourists like me cutting through the bar to go to the rest room. Waiting for the shuttle I saw at least five wedding parties. Apparently the art museum is THE place to come to for your wedding photos. They pull up in a big limo or bus and hop out for photos and then hop back in and take off. There is a nice fountain area that is quite popular for these Kodak moments, as well as a scenic spot by Lake Michigan. One bride hoisted up her skirts and climbed in the fountain, shocking the little boys playing there, who promptly ran away. Most fashionable were the bridesmaids in black and white print dresses - cute- and most unusual was the party with the bride in a chartreuse dress with a big hoop skirt. When the convention was over I headed for Baraboo, Wisconsin, the site of Circus World Museum and the former winter home of Ringling Brothers' Circus. There was a miniature circus convention going on there with a lot of old guys showing their little circuses and talking about miniatures. I got there just in time for the Big Top Circus Performance. These people would all be rejected by America's Got Talent. Little kids enjoyed it, but it was so tacky that it was almost endearing. The lovely assistant for the dog act is a woman "of a certain age," but still looks pretty good in her sequins. There were elephant and pony rides for the kiddies, and a couple of the ponies seemed to be napping. The museum exhibits part was actually pretty good. 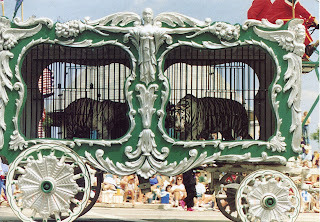 There were a lot of circus wagons, a history of the Ringling circus, lots of memorabilia, and old circus posters. They had circus costumes for kids to try on and they were pretty excited by that. After my tour, I passed up the circus hot dogs and went looking for a place to eat. When I walked into the restaurant, I knew I was in the right place. I heard a man who was paying his check tell the girl he'd been coming to the restaurant (Jen's Alpine Cafe and Soup Kitchen) for over 50 years. Turns out it is the longest established restaurant in Baraboo and made a fine omelet. A side note about eating in a Wisconsin supper club. This is a unique establishment that I've only seen them in the North Woods of Wisconsin. A supper club is a restaurant with a bar. The entrance is through the bar and you come in and take a seat in the bar. You order a drink (even a coke is okay) and when you are about half through with it, the bartender will offer you the dinner menu. About the time you order your second drink, a waitress will come by and take your order. When you are about done with the second drink, you will be told your table number, and your salads will be on the table. Often the meal comes with a classic relish tray -- pickles, olives, radishes, celery and carrot sticks, crackers, and cheese spread. The exception to the protocol is Shaffers in Crivitz. They don't offer a menu, they just come to take your order. If you ask for a menu, you are clearly a foreigner, maybe even from Illinois. Everybody knows that all you order there is chicken, white or dark, whole or half portion, with baked potato or fries. You can get a side order of gizzards. The doggie bags there are actually plastic bags that say "doggie bag" on the side. Once we went to Shaffers and were the only people there. We still had to sit in the bar and have the required two drinks before the table was ready. Back to my Wisconsin tour. 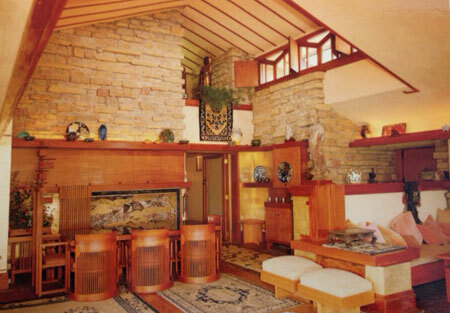 Taliesin, near Spring Green, was the summer home of American architect Frank Lloyd Wright. Wright began the building in 1911 after leaving his first wife, Catherine Tobin, and his Oak Park, Illinois, home and studio in 1909. I went to Taliesin and took the highlights tour, which gave a tour of the main house and the school building. I expected the tour to be glorifying Wright, but it wasn't. The guide talked about him, warts and all, pointing out things he had lied about in his autobiography, for example. This guy knew his Wright biography, coming to Wisconsin for the summer for the past 13 years to guide tours. During the winter he lives in Florida where he runs tours of some Wright buildings down there. He could discuss Wright-designed buildings all over the country. There are some 90-year-old former Wright Fellows living on the property so the guide gets some of his stories from them. If you went to work as a Wright Fellow, it was assumed that you would always work and live there, so these people retired there and are still supported by the Foundation. I'd always wondered about the uncomfortable straight-backed chairs he designed. The guide said Wright knew how bad they were and admitted he couldn't design a good chair. He complained about having to sit in those chairs when dealing with customers. For his own house, he went to Marshall Fields and bought a bunch of comfy chairs. For the homes he designed, however, he insisted they use everything he provided and reserved the right to show up any time and purge the home of anything not Frank Lloyd Wright-designed, and he did do just that on occasion. Wright died broke and the Foundation that runs the place has to be self-supporting. It has to cost a lot to maintain because the house was built with very poor materials and constructed by his apprentices who had no building experience. Wright thought the house was for experimental purposes, so would add rooms or modify them on a whim, very Sarah Winchester of him. He once had the apprentices quickly enclose a porch to turn it into a breakfast room so Solomon Guggenheim would have a nice place to drink his morning coffee when he came to talk about a proposed museum. Must have helped. I think Wright's love of plywood contributes to the overall rundown look. Wisconsin Dells was my last stop. I thought that was just an area, but it is a town too. Before now, I always considered Gatlinburg, TN to be the gaudiest, tackiest town I'd ever seen, but Wisconsin Dells outdoes it. The Dells has a zillion souvenir shops, fudge shops, Ripley's Believe it or Not, Wizard Quest, a casino, haunted house, magic shows, adult accessory shops (you know what I mean), lots and lots of water parks, and an upside down White House for a top secret experience. Now that is one bizarre building. 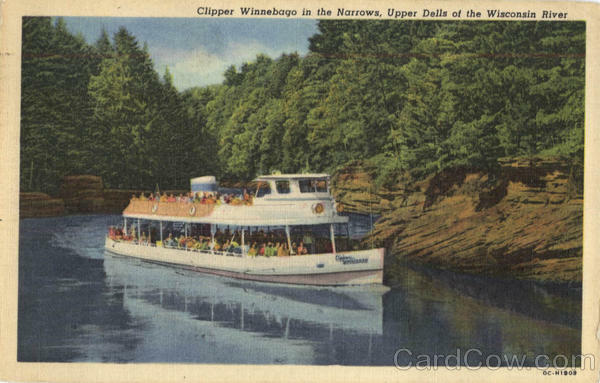 I passed on all of those attractions and opted for a two-hour boat ride on the Wisconsin River, which was quite lovely. It's funny that Wisconsin Dells is on the river, but most people spend their time in the artificial water parks. We stopped twice for short walks on shore and opportunities to buy concessions and souvenirs. One of the walks was through an area with tall rock walls that narrowed down to a cave-like area -- dark, rather cold, and narrow. The highlight was supposed to be seeing a dog jump between two tall rock formations about 5 feet apart. For some reason, the dog couldn't do it that day, so the trainer did it instead. The guy got up from his lawn chair, ran about 10 feet, jumped, turned around, ran back, jumped, waved to the crowd, and sat back in his lawn chair. Odd. There are many other famous and not-quite-so-famous places to visit in Wisconsin. Don't get me started on The House on the Rock, the most unusual of all. A family could amuse themselves for weeks on end in Wisconsin in the summer or winter (Go Packers!). I look forward to returning (in the summer; I'm no fool) and exploring another region of Wisconsin. By the way, none my family members had visited any of these tourist attractions. What am I missing around my own home town?